I never feel more entirely out of my sphere, than when presuming to write in an album. This suggestion of beauty elegance and refinements whilst my habits of life passed [past] history – & present occupation have called into exercise all the sterner qualities of my head and heart – so that I walk upon uneven – uncultivated and stony ground – gazing upon huge rocks with far more pleasure, than I experience, while promenading the most richly cultivated garden and gazing upon the most luxurious flowers. It is mine to grapple with huge wrong with gigantic tyranny – to launch the fiery denunciations of outraged and indignant men at the hoary headed oppressor! – This my dear friend is my apology for not writing something becoming the pages of your precious Album. 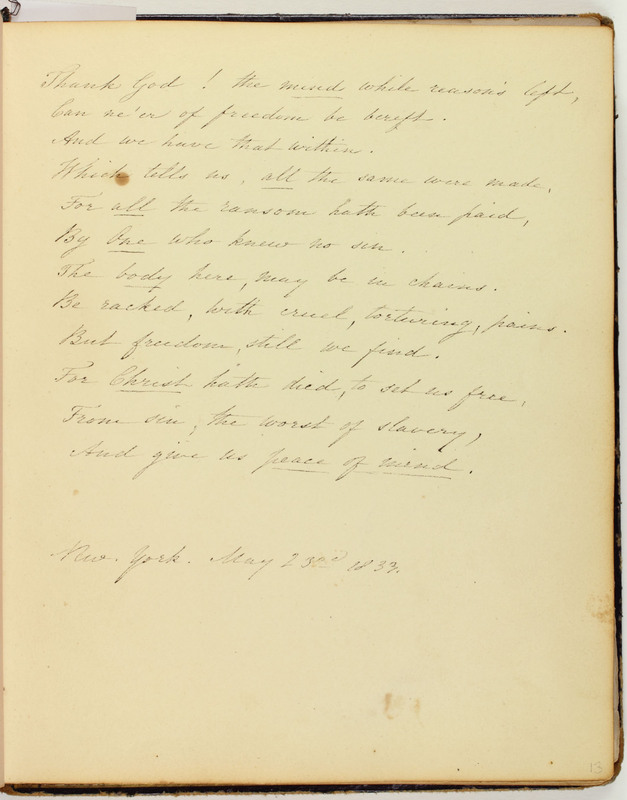 This entry by Frederick Douglass (c. 1818-1895) is perhaps the only one in Cassey’s album by a former slave. The differences between Douglass’s entry by a man who knew the horrors of slavery and by those who have been free their entire lives are telling. His life has made his personality stern, while albums demand “beauty” and “elegance.” Douglass receives more pleasure from gazing at rocks than he does from walking through gardens and viewing beautiful flowers. 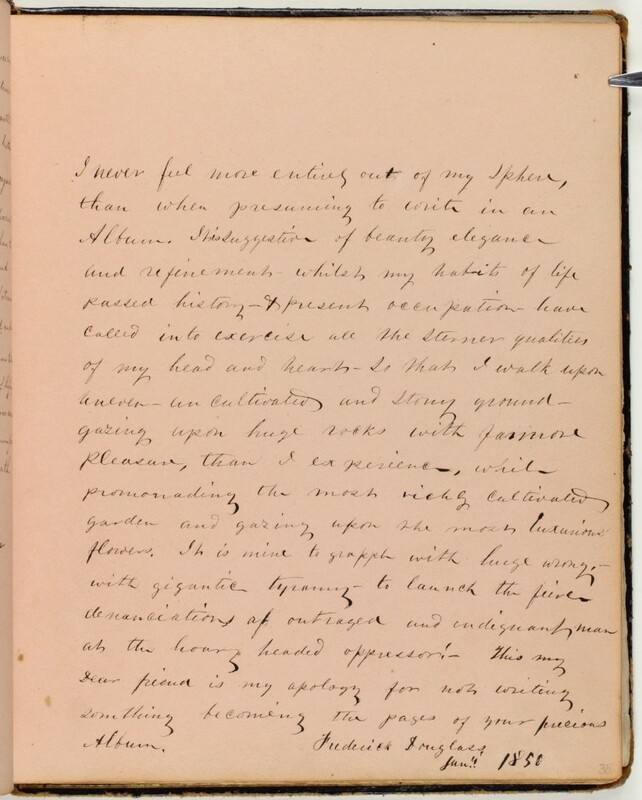 His duty is to struggle with the “gigantic tyranny” of slavery, and because of this he does not have the luxury of stopping to “gaz[e] upon the most luxurious flowers.” The autobiographical entry provides a glimpse into Douglass’s life not present in his public persona.